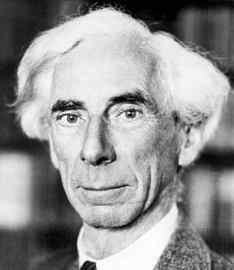 Bertrand Russell was born in Trelleck, Gwent, as the second son of Viscount Amberley. His mother, Katherine, was the daughter of Baron Stanley of Aderley. She died of diphtheria in 1874 and her husband passed on twenty months later, so that, at the age of three, Russell was an orphan. He was brought up by his grandfather, Lord John Russell, who had been prime minister twice, and Lady John. Inspired by Euclid's Geometry, Russell displayed a keen aptitude for pure mathematics and developed an interest in philosophy. At Trinity College, Cambridge, his brilliance was soon recognized, and brought him a membership in the 'Apostles,’ a forerunner of the Bloomsbury Set. After graduating from Cambridge in 1894, Russell worked briefly at the British Embassy in Paris as honorary attaché. In the next year he became a fellow of Trinity College. Against his family's wishes, Russell married an American Quaker, Alys Persall Smith, and went with his wife to Berlin, where he studied economics and gathered data for the first of his ninety-odd books, German Social Democracy (1896). Russell's fellowship dissertation, Essay on the Foundations of Geometry (1897) was out a year later. "It was towards the end of 1898 that Moore and I rebelled against both Kant and Hegel. Moore led the way, but I followed closely in his footsteps," Russell wrote in My Philosophical Development (1959). The Principles of Mathematics (1903) was Russell's first major work. It proposed that the foundations of mathematics could be deduced from a few logical ideas. In it Russell arrived at the view of Gottlob Frege (1848-1925), that mathematics is a continuation of logic and that its subject-matter is a system of Platonic essences that exist in the realm outside both mind and matter. Principia Mathematica (1910-13) was written in collaboration with the philosopher and mathematician Alfred North Whitehead. According to Russell and Whitehead, philosophy should limit itself to simple, objective accounts of phenomena. Empirical knowledge was the only path to truth and all other knowledge was subjective and misleading. However, later Russell became skeptical of the empirical method as the sole means for ascertaining the truth and admitted that much of philosophy does depend on un-provable a priori assumptions about the universe. He, however, maintained that philosophy could and should deliver substantial results: theories about what exists, what can be known, and how we come to know it. After Principia, Russell never again worked intensively in mathematics. Russell's interpretation of numbers as classes of classes gave him much trouble: if we have a class that is not a member of itself - is it a member of itself? If yes, then no; if no, then yes. After discussions with Wittgenstein, Russell accepted the view that mathematical statements are tautologies, not truths about a realm of logico-mathematical entities. In 1907 Russell stood unsuccessfully for Parliament as a candidate for the Women's Suffragate Society. The next year he became a Fellow of the Royal Society. Believing that inherited wealth was immoral, Russell gave most of his money away to his university. His marriage ended when he began a lengthy affair with the literary hostess Lady Ottoline Morrell, who had been a close friend of the Swedish writer and physician Axel Munthe (1857-1949). Other liaisons followed, among others with T.S. Eliot's wife Vivien Haigh-Wood. Later Russell wrote about his sexual morality and agnosticism in Marriage and Morals (1929). Russell stated that human beings are not naturally monogamous, outraging many with his views. In 1927 Russell wrote in Why I Am Not a Christian that all organized religions are the residue of the barbaric past, dwindled to hypocritical superstitions that have no basis in reality. At the outbreak of World War I, Russell was an outspoken pacifist, which lost him his fellowship in 1916. Two years later he served six months in prison, convicted of libeling an ally - the American army - in a Tribune article. While in Brixton Gaol, he worked on Introduction to Mathematical Philosophy (1919). World War I darkened Russell's view of human nature: "I learned an understanding of instinctive processes which I had not possessed before." Also Ludwig Wittgenstein's criticism of Russell's work on the theory of knowledge disturbed his philosophical self-confidence. Russell visited Russia in 1920 with a Labour Party delegation and met Vladimir Lenin and Leon Trotsky, but returned deeply disillusioned and published his sharp critic The Practice and Theory of Bolshevism (1920). In 1922 Russell celebrated his fiftieth birthday, believing that the "brain becomes rigid at 50." He was famous and controversial figure - "'Bertie is a fervid egoist," Virginia Woolf wrote in her diary about her friend, but Russell saw himself as "a non-supernatural Faust." From about 1927 to 1938 Russell lived by lecturing and writing on a huge range of popular subjects. He pursued his philosophical work in The Analysis of the Mind (1921) and The Analysis of Matter (1927). Between the years 1920 and 1921 he was a professor at Peking and in 1927 he started with his former student and second wife Dora Black a progressive school at Beacon Hill, on the Sussex Downs. In On Education (1926) Russell called for an education that would liberate the child from unthinking obedience to parental and religious authority. The experiment at Beacon Hill lasted for five years and gave material to the book Education and Social Order (1932). In 1936 Russell married Patricia Spence, who had been his research assistant on his political history Freedom and Organization (1934). In 1938 he moved to the United States, returning to academic philosophical work. He was a visiting professor at the University of California at Los Angeles and later at City College, New York, where he was debarred from teaching because of libertarian opinions about sexual morals, education, and war. An appointment from the Barnes Foundation near Philadelphia gave Russell an opportunity to write one of his most popular works, History of Western Philosophy (1945). Its success permanently ended his financial difficulties and earned him the Nobel Prize. In 1944 Russell returned to Cambridge as a Fellow of his old college, Trinity. During WW II Russell abandoned his pacifism, but in the final decades of his life Russell became the leading figure in the antinuclear weapons movement. From 1950 to his death Russell was extremely active in political campaigning. He established the Bertrand Russell Peace Foundation in 1964, supported the Jews in Russia and the Arabs in Palestine, and condemned the Vietnam War. In his family life Russell had his own tragedies: his son John and his granddaughters Sarah and Lucy suffered from schizophrenia. Russell turned over the care of John to his mother, Dora. Lucy immolated herself five years after Russell's death. Though Russell was a pioneer of logical positivism, which was further developed by such philosophers from 'Vienna circle' as Ludwig Wittgenstein and Rudolf Carnap, he never identified himself fully with the group. In Human Knowledge: Its Scope and Limits, Russell argued that, while the data of sense are mental, they are caused by physical events. The world is a vast collection of facts and events, but beyond the laws of their occurrence science cannot go; it only gives us knowledge of the world. Detailed structure of the mind.